A collection like the Bloch or the J & J, both rich in extraordinary chalcedony bottles with wholly or partly natural designs, gives the impression that they are commonplace. As a group they are, of course, but the superb quality of the examples concentrated in these two collections also gives the impression that the masterpieces are fairly commonplace, which is not the case. The best of this art form stands as one of the great monuments to the Chinese creative interpretation of natural materials in art. Nowhere has this spirit been more consistently and astonishingly epitomized than in parti-coloured hardstone snuff bottles, among which the chalcedony group represents an unquestioned zenith of imaginative art, combining nature and humankind. In example after example, there is a consistent level of miracle in achieving seemingly impossibly clear and evocative subjects with the barest of surface editing, and in some cases none at all. This is another of the masterpieces of the genre, so many of which are in this collection. With only slight editing to interrupt the formal integrity of the surface, the artist has created two birds, probably intended as ducks, although they may be geese. They emerge from the stone with personalities that would be extraordinary in a painting, let alone in a hardstone carving. This example represents a fairly standard approach to creating silhouettes from natural material, where a thin plane of colour has been edited, usually, as in this case, by lowering the surface slightly to eliminate unwanted colour around the profile of the subject. The nature of this process, of course, means that sometimes there may be some ambiguity in subject matter. If two ducks, then it is a symbol of marital harmony, the dark and light birds representing the male and female (yinyang). If geese, then it is a reference to the great fourth-century calligrapher Wang Xizhi, who, through his love of the creatures, has become forever associated with them (see Sale 1, lot 123 for an example of this theme on an amber bottle). Birds of various sorts are the most common subject for ink-play agates (the natural and lower relief versions of which are also known as shadow or silhouette chalcedony and agate bottles). The simple outline of a bird was readily interpreted from a wide range of natural markings in the material, but the various symbolic associations of birds were also were highly valued. The dating of the more anonymous range of parti-coloured hardstone snuff bottles is difficult. They must have been made throughout the snuff-bottle period, but as yet we have been able to date to a reasonably narrow period range only a handful of examples. The ample size of this example may indicate a date from the Qianlong period or later, since large snuff bottles seem to have been initially a development of that lengthy reign, but in this particular case who is to say whether it is large because of an evolving preference for greater capacity or because the larger size was dictated by the need to bring forth the magic of the natural design? 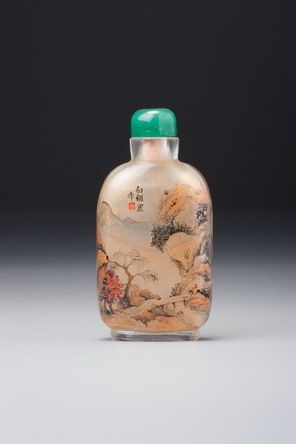 The most likely period, however, despite the broader possible dating range given, is perhaps the same mid-Qing period from the 1760s to the 1850s, decades that must have been responsible for a significant proportion of surviving old bottles. The habit was at its height on a national scale by this time, and courtly production was still massive, so it is hardly surprising that so many of our extant early examples date from this period.